Recipes are contained within a Job (although indirectly, as directly they are contained in a recipe set) and are themselves a container for Tasks. There can be more than one Recipe per Job. The purpose of a Recipe is to group a set of Tasks into a single logical unit (See: Job workflow details). The Recipe search is accessed through the “Scheduler” at the top of the page, and clicking on the “Recipe” menu item. To look up the “Recipe ID” enter a number into the search box and press the Lookup ID button. See System searching for details on searching. 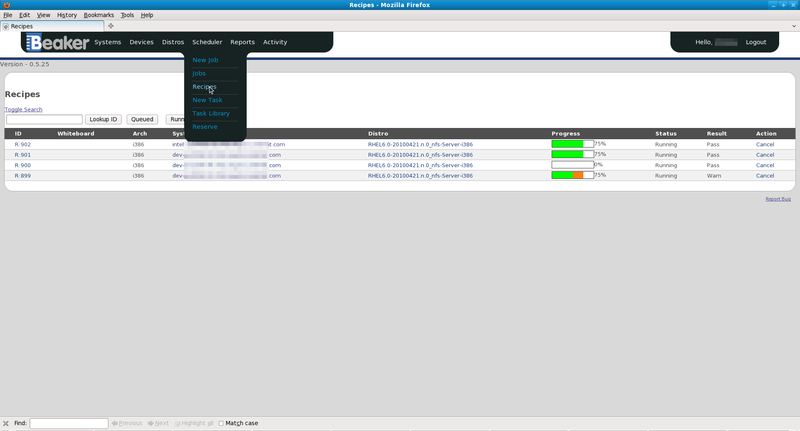 By pressing the “Running”, “Queued”, or “Completed” buttons you can quickly display Recipes that have a status of running,queued, and completed respectively. At any time you wish to cancel the Recipe, you may press the “Cancel” link that is placed under the “Action” column.